Lake Wylie, 24" x 36". Scale 1:32,000. Waterproof and tear-resistant! GPS Compatible, Mairina Listings, Lake Structure, Road Network and More. 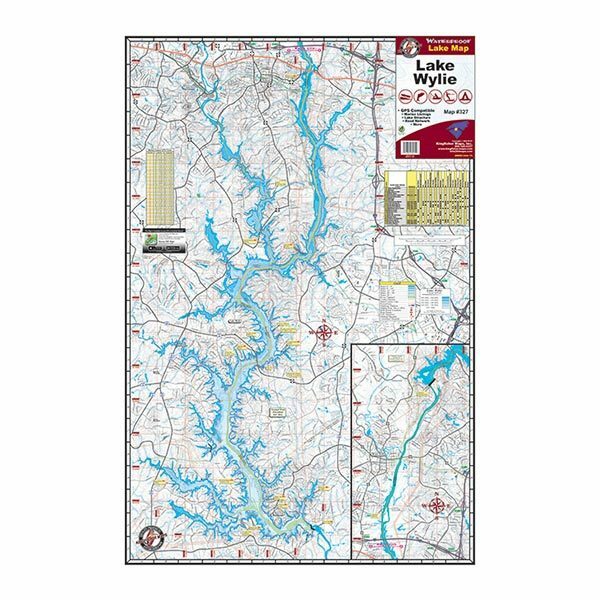 Nestled on the northwest shore of 12,455-acre Lake Wylie in York County. Lake Wylie is 17 miles from Charlotte, one of the nation's fastest growing commercial and financial centers and site of Charlotte Douglas International Airport; 15 miles from Rock Hill, strongly emerging as an economic hub in piedmont South Carolina; and less than 75 miles from Columbia, the capital of the Palmetto State. With 325 miles of shoreline, the Lake is ideal for boating, fishing, water skiing and sailing.